A child’s first day at secondary school is arguably one of the biggest milestones in their lives. It is the beginning of the transition from child to young adult. Children may worry about making friends and fitting in, about wearing their uniforms in the most fashionable style or about keeping up with the mountains of work that will come their way over the coming years. Parents may worry about their child’s safety at school, whether the school lunches are nutritious enough, whether their child will mix with those who are a good influence. Ryman Stationery has been established for 125 years and as such, has the expertise and product knowledge that comes from being around for so long, to help with many aspects of that first day of school, to the very last. Children will bring many items to school, but the most important item - regardless of whether it is their first year or their twelfth year - is their backpack, which will hold everything they will need to succeed. Heavy or oversized backpacks could also increase the risk of falling, particularly around stairs; and no one wants to see a showing of year seven dominos. These are worries that a parent does not need. This is why Ryman Stationery supply backpacks that are designed in the safest way possible. The Quattro Sparkle Backpack [£24.99] for example, has wide, comfort fit straps to prevent back strain making it ideal for long, book loaded days as well as trips outside of the classroom. Because comfort should not sacrifice style, Ryman have a wide choice of colours, shapes and sizes in their backpack range. The Converse All Star Chuck Backpack [£22.99] is one such product, maintaining the safety and comfort aspect that they believe to be so important and integrating it with the timelessness of a denim effect material. Despite some risks associated with overloading the rucksack, getting the right rucksack is important, it needs to be good quality as they generally take some abuse through the school year and it can say a lot about your personality. The Eastpak Padded Pak’r [£39.99] boasts a 30 year guarantee, and with it’s timeless, simple style it will be a long time before you have to worry about buying another bag. Health practitioners provide some good common-sense advice. Choose a good quality back pack with sufficient padding which fits your child well. Don’t overload it, the backpack should only weigh 10-15% of a child’s body weight, * and the weight should be spread evenly throughout the pack. Ryman have a good choice of compartmentalised backpacks that allow you to spread out the weight. 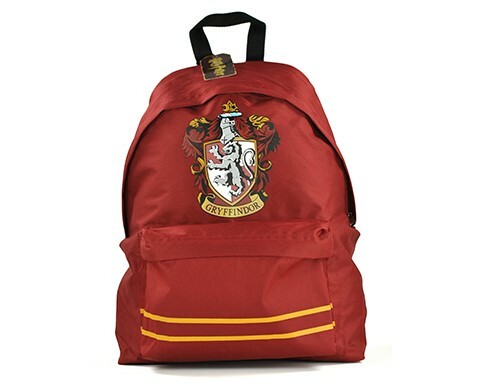 The Harry Potter Gryffindor Crest Rucksack[£24.99] is not only light to carry with its canvas material and compartmentalisation to help your child organise their belongings. For the student that is slightly older and looking to make a splash when entering their new year, perhaps the Dunlop Marble Effect Sports Backpack [£19.99} could be more suitable. This backpack provides the same features of comfortably padded, adjustable shoulder straps and compartments for increased space, organisation and weight distribution. Bags such as the Samsonite Guard IT Laptop Backpack 17.3-inch [£29.99] has extra padded internal compartments to keep your laptop, tablet and electronic devices safe and secure. This press release was distributed by ResponseSource Press Release Wire on behalf of Ryman Stationery in the following categories: Children & Teenagers, Men's Interest, Health, Women's Interest & Beauty, Education & Human Resources, Retail & Fashion, for more information visit https://pressreleasewire.responsesource.com/about.